Optimum operation of your machine is a key factor in securing your competitiveness. We design and manufacture ready-to-use industrial brushes to meet the needs of your specific application. 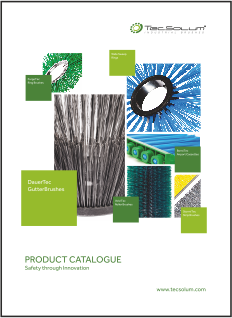 TecSolum, the leading industrial brushes manufacturer invites you to get to know our products. Aside from catalogued brush versions TecSolum offers manufacturing special brush versions (OEM) made according to your specification. Depending on the specific sweeper, it is possible to order custom brush system modifications and other changes specific to your expectations. But the market never stops developing, of course. Thanks to our Product Development and Technology Department we are always in touch with an ever changing market requirements. Our in-house expert consultants and technologically advanced manufacturing facilities mean that we can create and deliver custom brushes to suit your exact requirements quickly within the stated budget. Cooperation with our highly qualified research and development personnel has a key role to play in this regard. No hassle, no delays. It is all about one simple rule: “Show me who you work for and I’ll tell you who you are”. TecSolum is the partner that our customers can depend on 100%. In turn, we are especially proud of the customers we work for. Because we do our part with our quality products, so that major brands can offer the best possible quality. We are Johnston Sweepers partner and supplier. We are a business who has been supplying industry brushes to a diverse range of markets for over 10 years. Our aim is to provide our customers with best quality, durable brushes, delivered always on time.The trust and high-esteem we enjoy from our valued customers prove that we keep our promises.